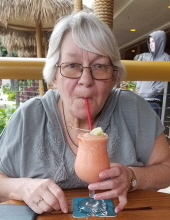 Bonnie Lou Blegseth, age 65, of Medford, died on Friday, April 5, 2019 at the Owatonna Hospital, Owatonna. Memorial services will be at the Boldt Funeral Home, Faribault, on Tuesday, April 9, 2019 at 6:30 p.m. with Father Henry Doyle officiating. A memorial visitation will be at the Boldt Funeral Home, Faribault, on Tuesday, April 9, 2019 from 3:00 to 6:30 p.m. prior to the service. Bonnie Lou Blegseth, the daughter of Marian (nee Christensen) King, was born on July 31, 1953 in Brainerd. Bonnie worked at Genova of Faribault for 24 years. She also worked at McKinley and Lincoln schools of Faribault for 10 years as a noon aide, as well as at the Dollar Tree. Her hobbies included fishing, going to the casino, and spending time with her grandchildren and her cat, Kitty. Bonnie was a loving and devoted caretaker to all her children and grandchildren. She is survived by her five daughters, Mandy (Sal) Pusateri, Ellen (Jason) Herrley, Tami Blegseth (special friend, John Zaharia), Ashley Blegseth (special friend Mo Yusuf), and Samantha Blegseth (special friend, Shawn McCollum); her sister, Sue (Bob) Wencl; seven grandchildren, Haley and Brandon Pusateri, Tegan, Allyson, Cortnee and Jaylyn Herrley, and Mathew Blegseth; and many other relatives and friends. She was preceded in death by her mother, Marian (nee Christensen) King; one brother, Bill King; and two sisters, Margaret King and Roberta Clarin. Visit boldtfuneralhome.com for more information at guestbook. "Email Address" would like to share the life celebration of Bonnie Lou Blegseth. Click on the "link" to go to share a favorite memory or leave a condolence message for the family.